Seven years ago, towards the end of 2011, I started to toss around the idea of an online freight marketplace, digitally connecting freight forwarders, carriers, and importers/exporters around the world. Why couldn’t international shipping be as easy and online as international travel, I asked? Many in the industry said that freight was too complex, too conservative, or too relationship-driven. But I reckoned that people said the same about travel agents, right up until 50% of airline tickets were purchased on the web. So I built a team who were not shy to take on the multi-year, multi-country challenge of modernizing one of the world’s biggest and most important industries. 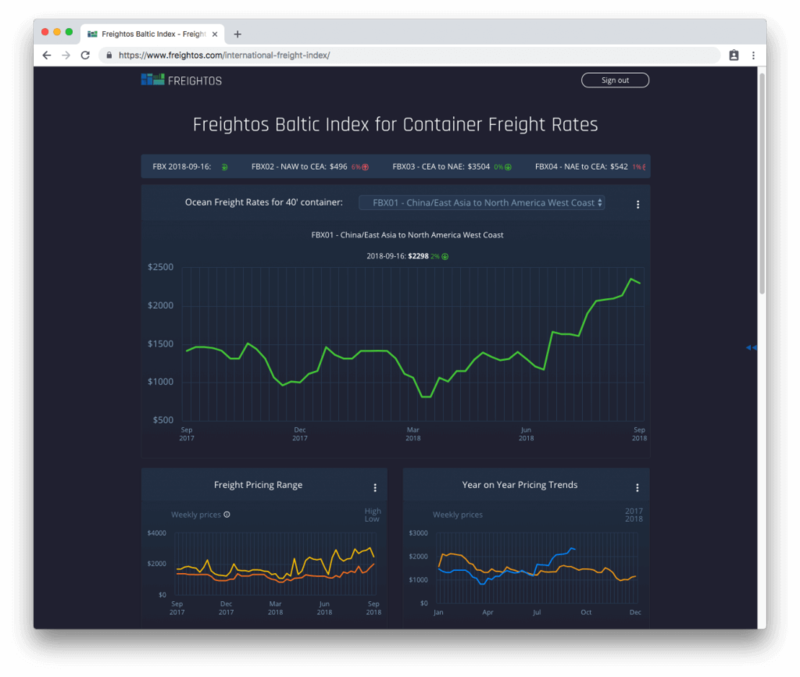 Seven years later, Freightos has built and scaled the world’s largest global freight platform, providing automation, digital transactions, and data insights to thousands of logistics service providers and tens of thousands of importers/exporters. Today, with a $44.4 million dollar funding round led by the Singapore Exchange (SGX), we’re gearing up to scale it even further. It’s no coincidence that our new lead investor is a major stock and derivatives market. We’re fast approaching the point where container shipping becomes a tradeable commodity. But before I get into how this fits into Freightos general vision or what we’re doing with the money, I want to take a moment to thank and congratulate the Freightos team – all 168 members spread around the world. Behind every feature, every line of code, every support call or chat, every logistics provider on-boarded, and every Freightos Baltic Index analysis written, is a person who believes this incredible but conservative industry can be digitized. I’m privileged to work side by side with such outstanding colleagues and look forward to more talented professionals joining our mission. From day one, Freightos’ goal has been to make global trade frictionless by bringing international freight online. Global trade is something we’re passionate about because it creates both jobs and consumer choice like nothing else. It’s the big equalizer. Millions of businesses, and of course all of us as consumers, rely on international trade. But we all pay for the fact that international trade is not supported by efficient international shipping. Then again, seven years later, I can confirm that digitizing the freight industry is easier to write about in a presentation than to actually deliver. 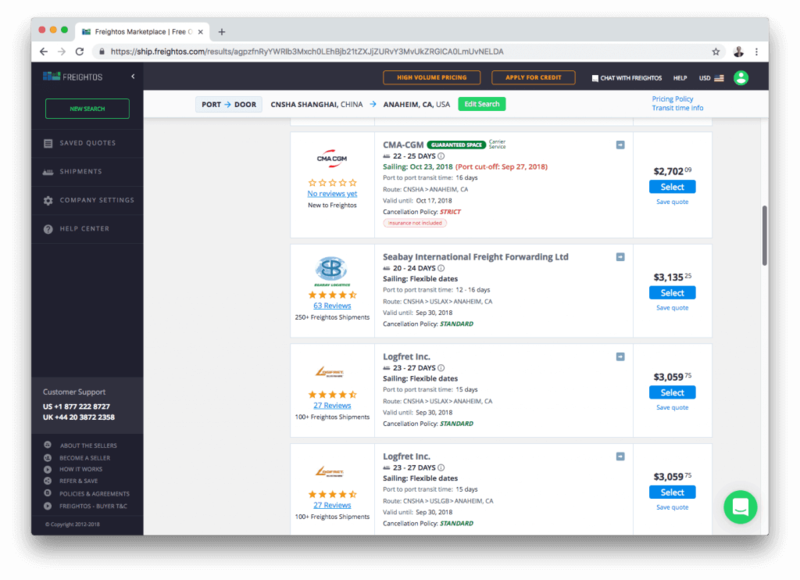 An online marketplace requires instant pricing in an industry where, when we started out, the average simple price quote took more than 3 days. It requires public rates, in an industry typified by secrecy and individual negotiations. It requires shipment management, in an industry where people don’t usually know where their containers are. And so it was clear that Freightos would not be one of those focused one-trick startups. Rather we have three major areas of activity: our online marketplace, our SaaS for logistics providers, and our data. And since there are no data standards in this industry, we created a team and technology to replace hundreds of thousands of messy Excel sheets from around the world, containing a couple of billion price points for air, ocean, and land, all to help freight forwarders automate the pricing of shipments around the globe, and, for those who are ready for it, to sell online. An important secondary benefit was the launch of the Freightos Baltic Index in partnership with SGX, who are now investors, and their subsidiary the Baltic Exchange. And over the data we layer technology. A routing algorithm. A pricing engine. Workflows. Analytics. And then we wrap those technologies in product offerings. SaaS for freight forwarders, carriers, and shippers. And the marketplace – an open platform where buyers meet sellers in real time. We continue to expand our worldwide network of customers. Freightos WebCargo is used by 1,200 forwarders and top tier carriers who search and provide for freight rates almost a million times a month! Freightos AcceleRate works with fewer forwarders – and primarily global enterprises – but is more comprehensive in providing a full, multi-modal solution. And our flagship Freightos platform connects service providers with shippers on a second by second basis. It’s incredible. But it’s still not enough. The scope has to keep expanding. Once we delivered a great experience for pricing and booking, people got frustrated by the lack of track and trace. So we got deeper into operations, documents, and payments. Now we’re looking at the experience of insurance and customs brokerage. Eventually, Freightos will offer the industry a truly end-to-end modern digital experience. Of course, Freightos does not act in a vacuum. Far from it. In the last year or two many others in the industry have started to get serious about digitization. Carriers and 3PLs are appointing Chief Digital Officers or Chief Innovation Officers. Carriers are launching direct-sales portals. Venture Capitalists who couldn’t spell freight a few years ago are pouring millions into LogTech startups. We were fortunate to get funded before investing in LogTech became trendy so we had a great head start and are already at the Series C stage. Comprehensive platforms are not cheap to build. We are incredibly fortunate to have sophisticated deep-pocketed investors who are willing to partner with us over many years to deliver real value to the industry. Expanding Freightos with more countries, more forwarders and carriers, more shipment management functionality, more predictable transit times, and more competitive pricing, while servicing progressively larger companies. It’s easy for me to talk about what we’ve done and what we’re doing. But is Freightos, together with our 3PL and carrier partners, making global trade smoother? The importers and exporters who ship on Freightos should have the last word. So here’s a small number of some of my favorite recent quotes – not based on size as much as how much this type of customer satisfaction showcases where we think this industry is going. To them, and to our thousands upon thousands of customers globally, thank you. We can’t wait to make Freightos even bigger and better. I have tried using DHL, FedEx, and UPS direct and it was a nightmare. This is as easy as ordering something off Amazon. Great service! Easy to use, love seeing all the different prices and options with just a few clicks. The follow up I got from them was FABULOUS and they got my shipment here QUICKLY! Compare global shipping options, prices, and providers in seconds. 100% free.